Quickly becoming the "it" place to go to get all things naturally glamorous, The Make-Up Lounge & Style Bar strives to always carry the latest and best in all natural and clean beauty products. We carry lines such as Indie Lee, Saint Cosmetics, Rituel de Fille, CV Skinlabs, Fitglow Beauty Cosmetics, KEVIN.MURPHY, Elate Clean Cosmetics, Esqido Lashes, Bésame Cosmetics, Truefitt & Hill, Coola Suncare, Lalicious and many more. This is your one stop shop for all things beauty. In addition, we offer a wide range of professional services including make-up services, hair services and barbering. 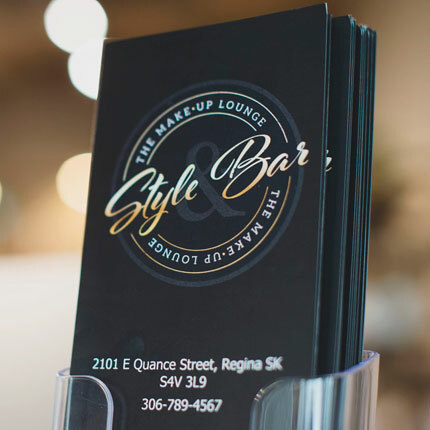 With professional, knowledgeable and highly-trained staff, your experience at The Make-Up Lounge & Style Bar is truly unlike anything you’ve ever had. We know that to find the best clean beauty products we have to look all over the world for them. What we found was a lineup of brands that use safe, sustainable, and ethically sourced ingredients to create products that do what they’re supposed to do. What we have curated is the very best from around the world, so that you only have to look in one place to see it all. Between our brands, ourselves and our consumers there is a common thread: Transparency. Beginning with our promise to carry clean, eco-friendly, sustainable products that also do not test on animals. Isn’t integrity a beautiful thing? We at The Make-Up Lounge & Style Bar believe in giving back to our community. Starting the Healing Through Beauty program we create a fun, educational evening for individuals going through cancer treatments. In addition, we support various charities in our community. This includes a one on one trial with your make-up artist as well as the application on the day of your wedding using the traditional make-up application technique. Includes your choice of a set of Esqido Lashes or Full size Elate Cosmetics Mascara plus your choice of a full size Elate Cosmetics lipgloss or lipstick. This includes a one on one trial with your make-up artist as well as the application on the day of your wedding using the Airbrush make-up application technique. The Airbrush gives the skin a beautiful, flawless finish and wears / lasts longer than traditional forms of make-up. Includes your choice of a set of Esqido Lashes or Full size Elate Cosmetics Mascara plus your choice of a full size Elate Cosmetics lipgloss or lipstick. If supplying your own lashes there is an $10 application fee. Lashes must be clean and unused for sanitary reasons. Make-Up Lesson: Complimentary with the purchase of $90 in product (before taxes). One on one with a professional make-up artist, here you will learn about proper skin care, how to recreate a look you would like to learn and how to use the right tools to achieve these looks. We also provide on location services (additional costs may apply). Please ask one of our professionals for details. Your appointments are very important to us. Since the services are reserved for you personally, we require a Deposit to reserve any 1.5+ hour hair service and all make-up appointments. If a cancellation is made WITHIN 24 hours of a 1.5+ hour hair service or any make-up services, your Deposit will be forfeited in fairness to the stylist, artist and other guests who have been trying to receive an appointment.